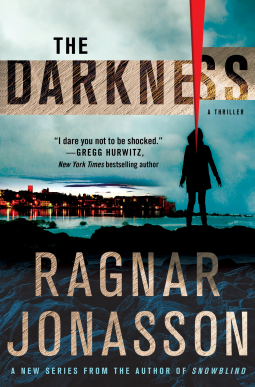 Ragnar Jonasson burst onto the American scene with Snowblind and Nightblind, the first two novels in the Dark Iceland series, and the praise was overwhelming. Now he launches a new series featuring a completely new sleuth, Detective Inspector Hulda Hermannsdottir of the Reykjavik Police department. When a young woman, an asylum seeker from Russia, is found murdered on the seaweed covered rocks of Iceland, Hulda starts to ask questions. But it isn't long before she realizes that no one wants her to investigate this murder. She eventually must decide whether solving this case is worth losing her life. Ragnar Jonasson’s Dark Iceland series is one of my favorite series of all time. With each new installment I am transported to Iceland to reconnect with characters who have become old friends. Everything I love about The Dark Iceland series can also be found in The Darkness - vivid descriptions of beautiful yet treacherous landscapes, a simmering mystery, and an endearing protagonist. At age 64 Detective Inspector Hulda Hermannsdóttir is quickly approaching retirement from the Reykjavik police. When Hulda’s boss moves up her retirement effective immediately, she is hurt, angry, and frightened. She will now be forced to face deep seeded secrets and fears sooner than she expected. As a parting gift, her boss allows her two additional weeks to work on a case of her choice. A year ago, a young Russian woman seeking asylum in Iceland was found dead on the coast of the Reykjanes peninsula; about 18 miles from Reykjavik. Every person Hulda questions has something to hide and no one seems to care about the death of the young woman. What Hulda uncovers could result in not only the end of her career but her life as well. Retirement is normally one of life’s milestones and something most people look forward to. For Hulda, who is without a family and minimal financial resources, retirement is something to fear and dread. More than anything she fears the loneliness of a life without work. Throughout her career she has always been a loner with few friends but she was surrounded by the bustle of a police station and the nature of the job forced her to interact with people. Without work, there will be no distraction - Hulda worries being alone will force all of her demons to surface. This is the most heartbreaking aspect of Hulda’s story. To overcome everything Hulda has had to endure only to be left alone is truly tragic. Readers will cheer Hulda on as she struggles to solve her last case. As I stated in the opening, everything I loved about The Dark Iceland series can be found in The Darkness. However there are many elements which make The Darkness very different from The Dark Iceland series. At 64, Hulda is the oldest detective I have read. While Ari Thor, the lead character of The Dark Iceland series is in his late 20’s. When reading books by the same author, I have sometimes noticed that the author changes they're writing style so much that I could not tell I was reading the same author. I could not find the component which made me want to read more of the author’s work. Jonasson has managed to carry over his atmospheric and enthralling style over to The Darkness yet the story is completely original; displaying his ability to be diverse while maintaining the staples which made me want to read everything he writes. In addition to being atmospheric and reminiscent of Agatha Christie, Jonasson also uses time to make his books more intriguing. In The Darkness readers meet Hulda at the end of her career. The next book of the trilogy, The Island will take place 25 years before the events of The Darkness. Some readers may find this odd, I did as well. But knowing how Hulda’s story is going to end will not dissuade me from reading the next book of the trilogy. I am extremely excited to read The Island, to learn why Hulda is a loner, why she has a distant relationship with her co-workers. At 64 Hulda is a tenacious and dedicated police officer. 25 years earlier at the height of her career, I imagine she was a force to reckon with. Hulda’s retirement looms over the story creating a ticking clock effect. If Hulda does not solve this case, it will not be solved. This ticking clock made The Darkness addictive and riveting. I was excited to see how the story ended but I did not want it to end. Similar to The Dark Island series, The Darkness features Iceland as a co-main character with it’s harsh weather and unforgiving forces of nature. Readers who loved The Dark Iceland series must add The Darkness to their list of must reads. Thanks to Minotaur Books for my free copy of The Darkness.